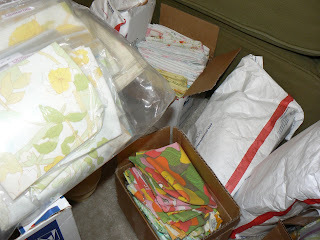 Crafty Little Beana: The sheets are slowly coming in. Hi Gail, I am one of the late ones! I was going to make it Saturday but they closed early and I didn't make it. Tomorrow for sure! I did have a question, how did you want the return postage sent? A pre-printed stamp,cash or what? Thanks, I can't seem to see your email! Have a fun holiday! Oh that is a great Question! Return postage can be a preprinted label or stamped return evelope. I found a pattern that I plan on using for my FQ from this swap! THanks for sharing :) I hope to post lots of links and projects after I sort and mail! I am still waiting on 6 swappers. HAPPY BIRTHDAY GAIL ON WED THE 10TH!!! !